Everything you need to know about teaching in the land of the Blue Dragon. Vietnam is a vision of rivers, karsts, ancient ruins, temples, beautiful post-colonial architecture, lush tropical countryside, and war memorials. It has a delicious and distinctive cuisine, its own art and dance forms, and lively celebrations. It is little wonder that so much of the economy of the country comes from the tourism industry. 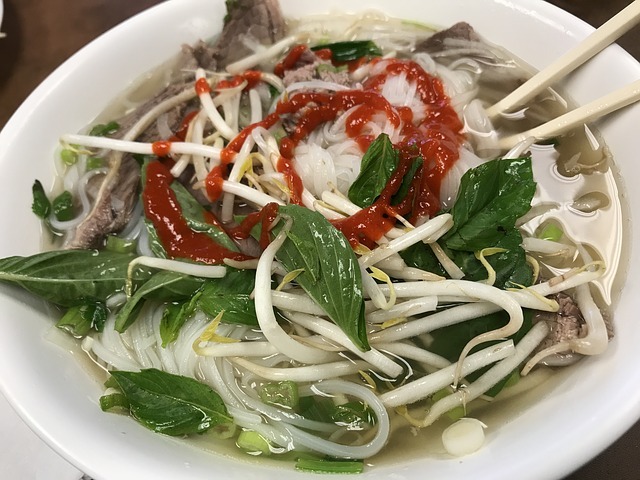 Recent years have seen over 10 million people coming to visit annually to gorge on Pho and celebrate the Lunar New Year. Prospective English teachers who are looking for a great base for living and working in Southeast Asia that can provide endlessly fascinating experiences, should consider the many benefits of a position in Vietnam. Earn between 18,000,000₫ – 35,000,000₫ per month! Vietnam is an adventure seeker’s paradise with mountains, beaches, and plenty of rich local culture. Vietnamese can be a tricky language to master, but don’t worry – English is widely spoken in most cities so you can easily get by with just a few phrases and pleasantries. Vietnam can be hot and humid summer months, but things cool down around November-January. If you’re heading to Ho Chi Minh, you’ll be fine with summer clothes, and if you’re heading to Hanoi pack a jacket. Wages in Vietnam can vary quite a bit, with teachers making anywhere between $800-$1,800 usd per month, depending on the type of school in which they work. Language schools are plentiful in most towns and just about everywhere in the major cities, so it should not be a struggle to find positions. Language schools run on the low end of the spectrum paying between $800-$1000 usd per month. The cost of living in the country is very low, and even the low end of the range can provide plenty for individual needs, entertainment, and potential travel to nearby countries. Vietnamese language schools almost always offer benefits like relocation packages, visa help, and in some cases housing. Higher salaries with equal or greater benefits such as airfare reimbursement can be obtained through employment with International Schools, which typically pay anywhere from $1200-$1800 per month. These schools usually recruit in the Summer months and potential teachers need a TEFL certificate, and if possible, a few years of experience to be competitive for candidacy. Both International Schools and Language Schools often hire online and conduct interviews via Skype, though it is also possible to line up a job at a language school while already living in the country. Ho Chi Mihn City is vibrant, colorful, busy and noisy. Some teachers will absolutely love the buzz of the big city, riding their motorbikes past old buildings, skyscrapers, and active construction sites, and for them, there is one of the biggest markets in the teaching world waiting to be explored. Unlike some other large cities in Southeast Asia, there is not a significant difference in expenses between the city and smaller towns, so money will stretch the same as it will in rural locations, so long as you don’t shop at the mega malls too often. For culture lovers, the city has much to offer with many pagodas, temples, markets, and museums. If your hobbies include boating or photography this might be a perfect choice for you. Can Tho is about a hundred miles from HCMC along the Mekong River, and is a particularly attractive destination for those who love markets, as its floating markets are world famous. Teaching jobs are easy to come by, and teachers can boat out to the backwaters of the delta on weekends. Da Nang is quickly becoming a favorite for teachers, for its beauty and convenience. The city has a beautiful stretch of beach, interesting bridges, cute shops, excellent food vendors, and fantastic weather for most of the year. It also has its own airport and is about equidistant to Hanoi and Ho Chi Minh city, which makes it ideal for taking long weekend expeditions to other areas of the country. This is not to mention it’s proximity to the exceptionally lovely Hoi An, a town well known for it’s ancient old town, canals, and romantic lantern lit streets. It is also near the Marble Mountains which provides excellent hiking opportunities. Da Nang is also just a bit less hectic than the capitol or HCMC. Hue is famous for a complex with ancient Chinese architecture which has been listed as a World Heritage site. It is a great destination for tea lovers and anyone who likes to eat their cookies on imperial era China, but more generally, people who want a slightly more relaxed yet high culture vibe will feel drawn to Hue. Jobs are a little scarcer than in bigger cities, but still come up often enough. Nha Trang is for those who like to pamper themselves after work days, as it is particularly famous for its beaches and spa resorts. Mud spas are the main draw for tourists to the town, but teachers stay for the beaches and the particularly great snorkeling and diving opportunities on the coast. Hanoi is a great place to learn to love Vietnam’s culture. You can see Ho Chi Mihn’s old residence, explore Confucian temples, and watch water puppet shows as you snack on street food. It is also near enough to Ha Long Bay for a weekend trip to the famous karst formations. It is a good choice for those who like a good mix of scenery and more urban appeal. Hai Phong is a couple hours from Hanoi and quite a large city itself, the third largest in the country. It is very convenient and near to beaches. It is popular with teachers as there are many job openings, and it is near enough to other attractions in the North. 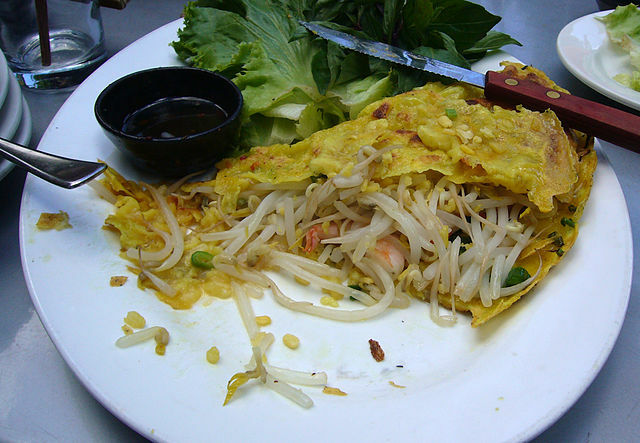 Vietnamese cuisine is a delicious mix of traditional recipes perfected through countless generations, combined with ingredients from its colonial past. In recent years high-class Vietnamese restaurants have started to appear in the west, but trust us – the real thing is a whole other experience. Sometimes eating noodle soup can be a religious experience. The French brought the baguette and pate to Vietnam and the Vietnamese brought all sorts of other things into the mix. 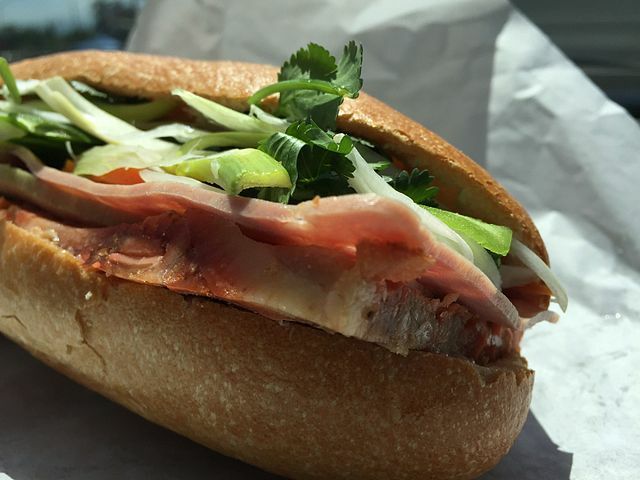 A typical sandwich is full of roasted pork or sometimes chicken, with pickled vegetables, cucumber, chili and condiments. It’s a great daily lunch. These fried pancakes that are particularly great for winter comfort eating. Non-native teachers: If you don’t have a passport from the UK/US/IRE/CAN/AUS/NZ/SA, you can still get a fully legal work permit in Vietnam (woo!). Teachers without degrees: Having a bachelor’s degree (in any subject) is a requirement for gaining a work visa in Vietnam. Having one will ensure you’re able to gain a fully legal work permit. However, while most schools in Vietnam will ask for a degree, many will still hire teachers without one, particularly if you have a notarized TEFL certificate and can bring lots of energy into the classroom. It’s common for schools to arrange a business visa, employ teachers on tourist visas, or to pay some money to get a visa arranged through other means. This means that there are lots of teachers without degrees which work all around Vietnam – however, it’s not something we’d recommend.